Axiomatic is part of the Bauma 2019 in hall A2, booth 449. The CAN products are also shown at the CiA stand in hall A2, booth 337. 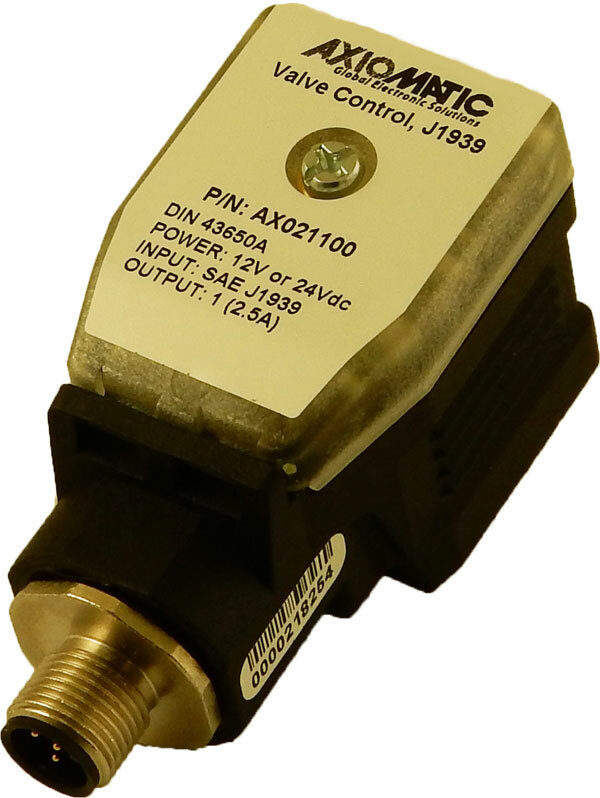 The company releases a CAN (SAE J1939 or CANopen) connected single valve controller with DIN 43650A mounting style. The version AX021100, accepts SAE J1939 and version AX021101 accepts CANopen messages to command a solenoid up to 2,5 A. Powered by 12-V or 24-V machine batteries, the DIN 43650A mounting style locates the electronics directly on the valve for distributed control. Other form factors available include a remote mount model, a plug-in for valve molded TE Deutsch DT20 connectors and a DIN rail mount model for control panels. The DIN 43650A models include analog command inputs and economy versions with fixed parameters. The electronic controls are designed for machine applications with vibration compliance, IP67 rating, and operation from -40 °C to +85 °C. An LED indicator provides status of operation and the M12 connector simplifies wiring. The company also shows another new product. Using near field communication (NFC), the NFC valve controller is configurable while unpowered. It can be configured from an Android phone application in proximity to the NFC controller. 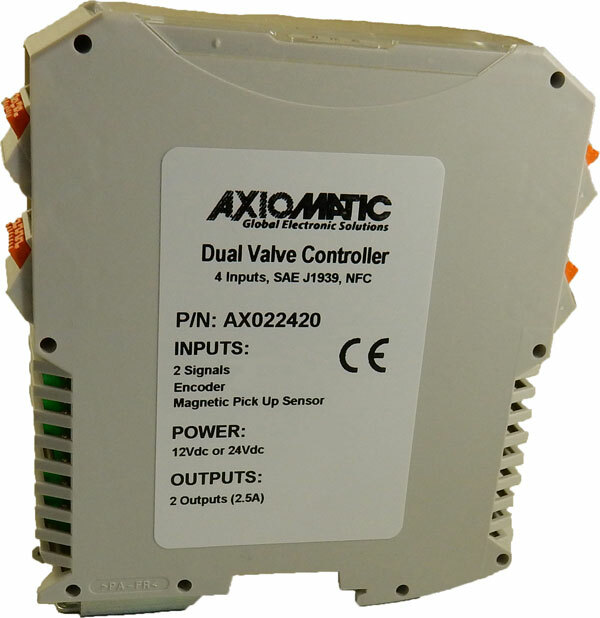 As a highly flexible controller, the valve controller with NFC accepts two command signal inputs and drives two solenoids up to 3 A. Other interfaces can include a magnetic pick up sensor and encoder. The outputs are user selectable as high side, low side, or half-bridge type. Many control profile parameters are user configurable. A DIN rail mount and a fully sealed IP67 form factor are available. Operation is from -40 °C to +85 °C. Designed to interface with 12-V or 24-V battery power, it is suitable for machine and industrial applications. Using NFC, the valve controller is remotely configurable while unpowered via a smartphone application available from Google Play. Bringing the two devices within 2 cm of each other, the NFC technology uses magnetic induction between two loop antennas to communicate within the globally available radio frequency ISM band of 13,56 MHz. Communications have password protection built-in to the NFC technology which is often used in secure retail point-of-sale transactions.